The Pulse 6X has the same top quality construction and 200 foot depth rating as the top-performing Pulse 8X, but with less detection range. The Pulse 6X is in use by military, law enforcement, commercial, and salvage divers worldwide. 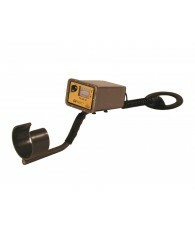 The claim-to-fame of this pulse induction metal detector is it's ability to ignore minerals in the environment while maintaining high sensitivity to all metal targets. The Pulse 6X is not affected by highly mineralized salt water, coral, rocks with a high iron content, or magnetic (black) sand; all of which drive conventional detectors crazy. The Pulse 6X detects all metals from coins and jewelry, to anchors and cannons. The diver is alerted to presence of a metal target by both visual readout (shown on the meter) and an audio output (heard in the underwater earphone). The detection range for a target is unaffected by the medium between the detector's coil and the metal object. Performance does not vary whether detecting through air, water, silt, sand, or solid coral. Powered by an internal 9 volt rechargeable battery pack, the detector will easily run all day on a full charge. Recharge the battery overnight and its ready for another full day day of hunting. 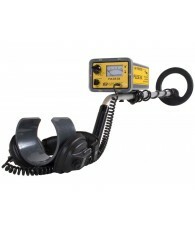 The Pulse 6X comes with all the accessories needed to use the detector on land and to dive to depths of over 200 feet. *Please Note: Version 1 and Version 2 are exactly the same with one exception. Fishers Pulse 6X and 8X detectors are two of the top performing underwater metal detectors on the market today. 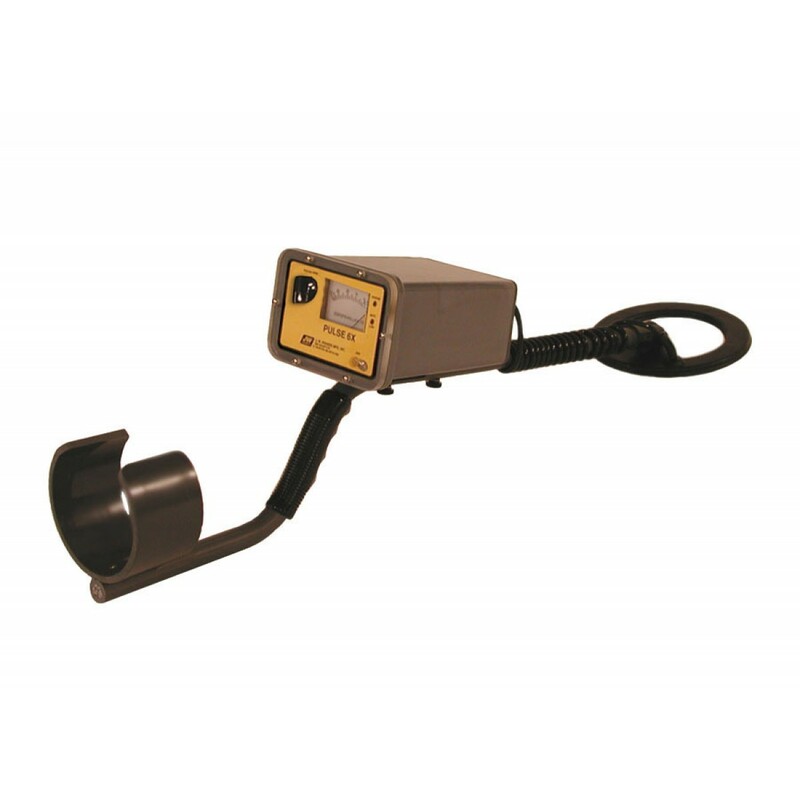 These commercial grade detectors are specifically designed for underwater operations, but work equally well on land, in fresh water or salt water. The 6X and 8X will easily locate a variety of targets including gold and silver jewelry, coins, artifacts, weapons, ordnance, anchors, pipelines, cannons and cannon balls. These high performance Pulse Induction metal detectors detect both ferrous and nonferrous metal objects, while ignoring minerals in the environment. The detectors will not give false detection signals from salt water, coral, high iron rocks, or other ground mineralization, as some other types of detectors do. With JWF detectors the detection range is unaffected by the material between the detector’s coil and the metal target. Whether detecting through air, water, silt, sand, mud, or coral, the detection range remains the same. The detector’s buoyancy is slightly negative in the water. This allows the diver to sit the detector on the bottom to dig a target without having it float away, which is a problem with “positive buoyancy” detectors. The underwater housing is a single solid casting with ¼” wall thickness and molded-in brass inserts. A ½ inch thick acrylic faceplate is fastened down with six stainless steel screws giving a maximum depth rating in excess of 200 feet. The top of the line Pulse 8X is the most sensitive pulse detector you can buy, and continues to be the choice of commercial and professional divers worldwide. The 8X is in use by US and foreign Navies, Coast Guards, FBI, Secret Service, numerous federal and state law enforcement agencies, and professional treasure hunters everywhere. This detector is covered by Fishers TWO YEAR UNCONDITIONAL WARRANTY. 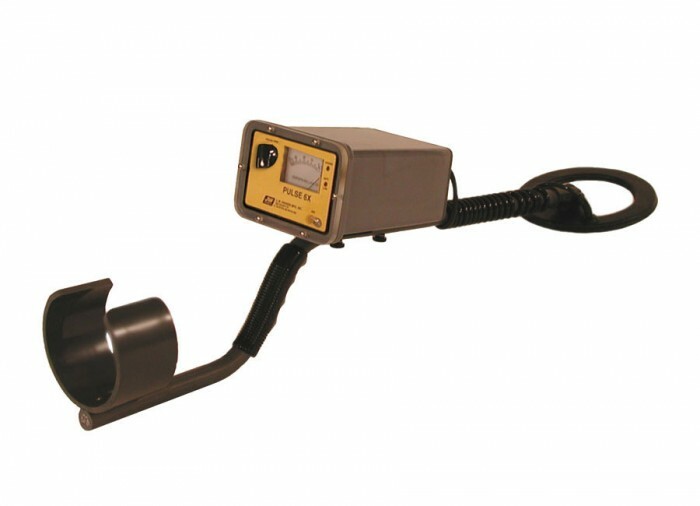 Pulse induction detectors have had a major impact on underwater metal detecting. Their claim to fame is simple: they are very sensitive metal detectors that do not detect minerals (extreme concentrations may give some reading). Their sensitivity is excellent, the best hand held units, with a 7.5" coil, will detect coin size targets at 9-12 inches, and larger objects to over 6 feet. Our pulse detectors are able to achieve their high sensitivity on land or in fresh or salt water without detecting either the water or the minerals on the bottom. Non-pulse detectors use compensation networks in a effort to reduce the effect of minerals on the detector. One manufacturer uses the motion technique which requires the coil to be constantly moving to detect anything. This gets rid of the mineral background only as long as the mineral background is of an even concentration; if it is not, false readings result. When the target alarm goes off you are never quite sure if it is a real target or not. Pulse detectors operate by transmitting a continuous stream of high energy magnetic pulses (one hundred per second) from the coil. After each pulse is transmitted the detector then listens for the return signal. When the transmitted pulse hits a metal object, an electro-magnetic field is induced in the object. This causes eddy currents to flow in the metal, which in turn generates a second electro-magnetic field. This field is picked up by the coil and then displayed by the meter. Discrimination - It Sure Sounds Great! Discrimination attempts to ignore the trash and only detect the “good stuff”. The fact is, discrimination also rejects many good targets and the detection range for all targets can be dramatically reduced. For these reasons we do not put discrimination on our detectors. Two examples on discrimination: In actual tests with a competitors pulse detector with discrimination, the detection range for a coin went from 6" without discrimination to less than 3" with the discrimination. The manufacturer of a motion detector (non-pulse) held a seminar which was conducted by a professional treasure hunter who stated “I don’t recommend using the discrimination control because you just can’t afford to miss a target”. 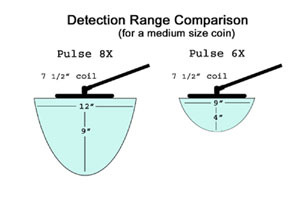 The detection range of a pulse detector is determined to a large degree by the coil size. Larger coils will detect large targets deeper, but have reduced range for the smaller targets. The 7.5 in coil is an ideal size for detecting both small targets, such as small rings, and larger targets to 6 foot deep. Optional coil sizes available: 5”, 10", 16", 18" with 100' cable, 8" x 48"oval with skids, and a 22” long hand probe. The larger loop sizes give wider detection envelopes allowing large areas to be covered. The 8" x 48" oval coil with up to 100' of cable is mounted on skids for towing along the beach or in shallow water. The hand probe has a small coil mounted in the tip and works extremely well in those tight areas where larger coils can’t fit. The 18" coil with 100' cable turns this diver held detector into a boat deployed detector where the coil is lowered from the boat. You can expect the following detection ranges whether in air or buried in mud, coral, sand, dry or wet, fresh or salt water. When I first started detecting with the JW Fisher Pulse 6x I searched mainly for coins, it didn't matter to me what they were, any coin was fine. I always considered it a good day if I came home with more coins than trash. As my experience grew and manufacturers brought out better and better machines, I concentrated my efforts on finding those deeper buried silver coins and Indian head pennies. Now that I knew what I was doing gold jewelry started showing up. After finding a good piece of jewelry, my wife and daughter were always there to claim it as their own! When I first started detecting I always had two blond haired blue eyed boys following me around saying "what did you find this time daddy"? Today those boys have boys of their own asking the same questions. Back in the early eighties while searching a large public park in Columbus Ohio, I heard a whisper of a sound that I thought was trash but there was a familiar ring to the sound it was sending back so I decided to cut a plug and dig it up six inches down. I found my first gold coin, it was a ten dollar gold piece in good condition. Since then I have only found two more, but with the price of gold today they are as they say "worth their weight in gold". Through the years manufacturers have improved the technology in their products so much that it takes a lot of the guess work out of detecting. I try to buy a new detector whenever a new model comes out just to see what advances this new model has.